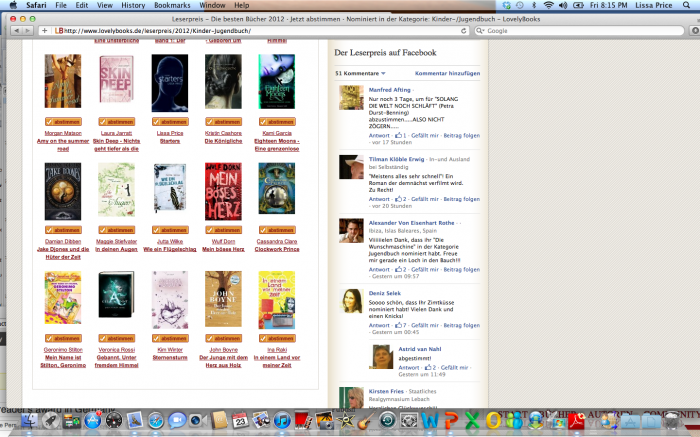 Starters was chosen by readers in Germany as one of their favorite YA books of 2012! This is a different voting contest and it ends in a few days. 2. You do not have to register, just look for the Starters title about halfway down the page. The cover will be a dark blue as you see in this photo below. Click on the orange box under the book (“abstimmen”). 3. The next page will ask for your name and email, just enter and click. The next screen confirms your vote. Easy (and only vote once please). Because it only goes to next Monday, Nov 26 German time zone, so more like Sunday in the US, please go now. Thank you so much for your support. If we win this one too, I’ll throw a Starters party somewhere next year!